Mediterranean food is unique because of the fact that so many different areas around the Mediterranean Sea contribute to this cuisine type. From Italy to Tunisia, Mediterranean food offers many different flavors and styles of food. Since Mediterranean food is so diverse, it is safe to assume that tons of different spices and herbs are used to create the unique flavors. For many people, salt and pepper are the best spices to use for every meal, but there are so many spices and herbs that can be used to add flavor to your dish and create a completely new taste. Knowing which spices to use for different meals may be difficult, but there are certain herbs and spices that are used in many Mediterranean dishes that can enhance the taste of your meals as well. Knowing which spices to use can help you create new and interesting dishes. At Baba Ghannouj Mediterranean Buffet, we know the best spices to use for your favorite dishes. If you want authentic and delicious flavor and are new to the world of spices and herbs, stop by Baba Ghannouj! We can give you the flavors you want in many different options—try out shawarma wraps, gyros, or curry for a tasty and delicious meal. While we will always be happy to offer your great tasting Mediterranean cuisine, it may be beneficial for you to learn about different spices and how they can add flavor to your favorite home cooked meals. In this blog, we will go over a few of the most important spices and herbs used in Mediterranean cuisine and how they can benefit your health and your food. This spice is often called the gold of spices. While it might be more on the pricy side, a small amount can change the flavor of your dish. Saffron is often used in rice or seafood dishes and is described as having a honey-like and grassy taste. The crimson colored spice is collected from the crocus flower and dried to be used in many different dishes for both flavor and color. Not only does saffron add a ton of unique flavor to dishes, but it also offers many health benefits. One benefit of saffron is that it contains vitamin C, allowing it to boost your immune system. Vitamin C also helps with the productions of collagen, helps heal wounds, improves muscle growth, and contributes to tissue production. Saffron also helps with circulation, blood pressure, mood, and many other things. You can read about all of the benefits from this Organic Facts article. 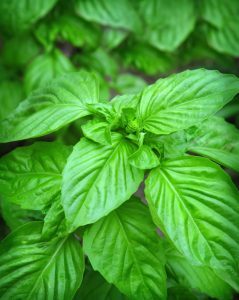 Basil is a common herb that many of us probably already have in our pantries. But there are many different ways to use the herb and it is offered in many different forms. You can add fresh basil to your meals or purchase it in dry flakes to easily add it to any meal. Fresh basil is going to offer a better and stronger flavor, but the dry flakes are perfect to always have ready. This herb offers a peppery and sweet taste, and is used in pesto, soup, salads, sauces, and other common dishes. Basil also offers many different health benefits. The herb contains beneficial properties, including: vitamin A, vitamin C, vitamin K, and manganese. According to a Dr. Axe article, some of the benefits of basil include the fact that it is an antioxidant, anti-inflammatory, improves the immune system, helps to detoxify the body, as well as many other benefits. Thyme is another one of those herbs that is quite popular, but unlike basil, recipes usually ask for dry thyme. Thyme has an herbal and minty flavor and is used in many different recipes, and often savory dishes. The flavor is really drawn out in slow-cooked recipes, like sauces or soups. This herb is an antioxidant, as well as a natural antimicrobial and antibacterial agent, allowing it to help keep your from infections. Thyme is also a great source of potassium and iron, helping control blood pressure and form red blood cells. The seeds of a flowering plant are known as cumin and used to add a punch of flavor to many different dishes. This spice is added to stews, couscous, and many other dishes for a taste that stands out. Cumin adds a slightly spicy taste to dishes and can used to add flavor to just about anything. Try it in marinades, chili, stews, and other dishes for a delicious taste that stands out. Cumin is also an antioxidant, helps to control blood sugar, and can fight bacteria. These are many different uses and benefits of cumin. This is a great spice to add to your collection, giving your dishes a punch of flavor and offering you many benefits. To learn more about the benefits of cumin, read this healthline article. While this is a spice that we all most likely have in our homes, most of us use it for sweet treats rather than savory dishes. Cinnamon is often used in Mediterranean dishes to add a spicy flavor to soups, vegetables, and meat. Next time you pull out the cinnamon, think about adding it to a savory dish to spice it up. This spice comes in stick or powdered form and can add a ton of flavor to many different dishes. Cinnamon has antioxidant properties and offers many health benefits. This spice can help reduce that risk of heart disease, lower blood sugar levels, and fight bacterial infections to name a few. There are many benefits to cinnamon, from keeping your healthy to adding flavor to all of your favorite dishes. Cilantro is an herb that adds to many dishes across the world. This herb is found from the leaf of the coriander plant and offers a sage and lemon like flavor. This is used in many dishes and adds a great taste to soups, salsas, and many other dishes. This is an herb that is better when fresh, so don’t waste your time with the dry flakes. Cilantro is a great herb to add to many of your dishes and can easily replace parsley in other recipes. Cilantro is another herb that offers many health benefits. It contains many vitamins and minerals that promote good health. Some of these benefits include: lowers skin inflammation, improves cholesterol levels, controls blood pressure, improves bone health, among many others. These are a few of the popular spices used in Mediterranean cuisine. They can be added to your pantry and used in many of your favorite recipes for additional flavor and health benefits. To get even more authentic flavor and Mediterranean style dishes, stop by Baba Ghannouj Mediterranean Buffet. Check out our main menu for great tasting options!